Too much trouble viewing PDFs? Questions inline this time. 1) “Pleased, But Not Satisfied” is written and published by – David Sokol who is long considered a possible heir to X. 2) The new consulting service is part of a general trend at Y to solve relevant problems faster. On July 29, Y launched a shorter-term contest that will serve as a model for its corporate contests. In this inaugural challenge, entrepreneurs are being asked to develop better technology to skim oil off of the surface of ocean water. The purse is smaller — the winner of the Challenge will get $1.4 million — and the competition will end in a year. What is Y? 3) The franchise has been sold to a group led by Hall of Fame pitcher and Nolan Ryan and Pittsburgh lawyer Chuck Greenberg. This baseball team was owned by Liverpool FC Co-owners Tom Hicks & George Gillett. Name this team which was owned by a group led by former US President George W Bush in the early 1990s before he became governor of Texas. We are launching our latest product, a set of 155 questions on the Tata group to help you crack those Tata round questions in Tata Crucible. Obligatory question: Who’s missing here? 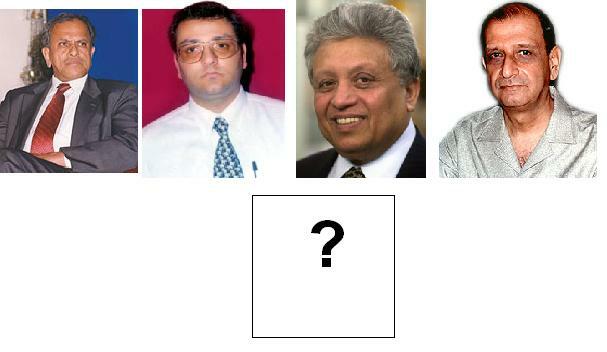 Ans: Shirin Bharucha (rest are RK Krishnakumar, Cyrus Mistry, Lord Bhattacharya, NA Soonawala). This is the 5 member panel that is responsible for finding Ratan Tata’s successor. Too many Tata related questions? Okay, here’s a set of five non-Tata sitters. Crack ’em all. Okay, folks. Time for some current affairs. Tata Crucible is almost here. Much thanks to all the paid subscribers. Thanks for all the emails. As many of you requested, here’s a set on 3 personalities-something similar to the last round of Tata Crucible. If you like this, sign up for more. PS: We have started mailing our business quiz sets and are through with 3 sets. Please note that you will get a set of 150/310 starting from the ‘current’ set. Thanks for all those responses. Happy to know that you are liking our quizzes. Here’s another set of 5 ‘Tata questions’. Tata Crucible is almost here. Here’s a set of 5 ‘Tata questions’. Thanks for the overwhelming response to Set #1. We will reply to your emails in a few days. Apologies for the delay. Click here for subscription details. The next set is here.